A fast-growing wildfire continued to rage into its fourth day Thursday morning, covering at least 30 square miles of the scenic San Jacinto Mountains and prompting more evacuations. The Mountain Fire destroyed at least six homes after blasting through the San Jacinto Mountains and continued to rage through 19,600 acres Thursday morning, keeping the mandatory evacuations in place for nearby communities. Firefighters reported the blaze was 15 percent contained. Authorities on Wednesday night ordered the evacuation of Idyllwild and Fern Valley, including nearby National Forest areas and Mt. San Jacinto State Park. The Mountain Fire broke out Monday afternoon in steep, rugged terrain on private property just off State Highway 243 near the resort town of Idyllwild (map), over the mountains and southwest of Palm Springs. By Wednesday evening, winds that drove the fire calmed and but the wildfire still spread topographically, coursing along the rugged terrain and charring dry chaparral and timber, fire officials reported. Winds remained light at about 5 mph while temperatures reached the triple digits. Heavy smoke spread into the Coachella Valley and Palm Springs area, and a smoke advisory was again issued for the Hemet/San Jacinto Valley, Banning Pass and Coachella Valley by the South Coast Air Quality Management District. The agency said ash was falling into the Coachella Valley, and air quality could be unhealthy. At about 4 p.m. Wednesday, an immediate evacuation order was issued for the Trails End community at the top of Morris Ranch Road (map). Shortly after 5 p.m., part of Idyllwild east of State Route 243 was evacuated, including Mount San Jacinto State Park, Fern Valley, and all campgrounds, U.S. Forest Service spokesman Bob Poole said. Pine Cove, Mountain Center, Idyllwild West and Poppet Flats were not evacuated, he said. The California Highway Patrol announced Wednesday evening that State Route 243 was closed Wednesday afternoon from State Route 74 north to 10 Freeway near Banning. State Route 74 was closed from Cranston Station in Hemet to State Route 371. At least 2,985 firefighters were battling the blaze, along with 228 fire engines, 17 helicopters, 10 fixed-wing aircrafts, 51 hand crews, 21 water-tenders and 15 bulldozers. The firefight had cost $4 million as of Wednesday morning, according to an incident update provided by the U.S. Forest Service, which manages the San Bernardino National Forest where the Mountain Fire was burning. Earlier, winds blowing from the west had pushed the fire east over the crest of the San Jacinto Mountains and toward an area south of Palm Springs, officials said. The fire was burning in the steep, rugged terrain covered in dry chaparral and timber in the southern portion of the San Jacinto Wilderness. "High winds, dry fuels, and steep inaccessible terrain challenged initial attack engines, crews and aircraft all day long," stated the 6 a.m. Wednesday update. Crews made progress on the north and south flanks of the fire, which had formed two heads and was backing down the south side of the mountain range. Winds were expected to weaken as the weather changes in coming hours and days, and that should help crews make more gains, the update stated. 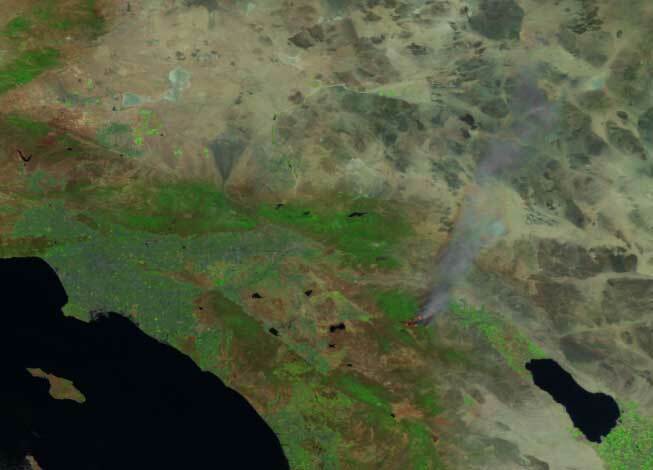 Smoke from the fire could be seen some 60 miles to the northeast, across Palm Springs and the Twentynine Palms U.S. Marine Corps training center, a satellite image from the National Oceanic and Atmospheric Administration showed, as seen at left. 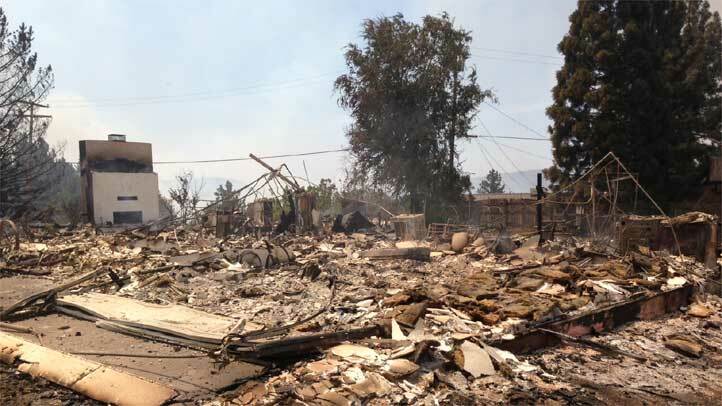 In the Bonita Vista area, the fire destroyed six homes, according to a Tuesday report on InciWeb. At Pine Springs Ranch summer camp and retreat, one commercial building, a workshop, garage, and cabin were destroyed. Eleven outbuildings and several cars were also destroyed by the fire. Resident Lawrence Goda, who lives on unpaved Bonita Vista Road, said neighbors who had been into the burned, still-evacuated area reported his home was almost completely destroyed. He said it was a log-cabin-style house he had built nearly 30 years ago -- and it was not insured. “Everything I worked for all my life is probably up in flames," Goda said. The scenic area -- the San Bernardino National Forest and adjacent Mount San Jacinto State Park -- is a popular destination for hikers, rock climbers and campers. San Jacinto Peak, the second-highest point in Southern California, is about eight miles north-northeast of where the fire began. 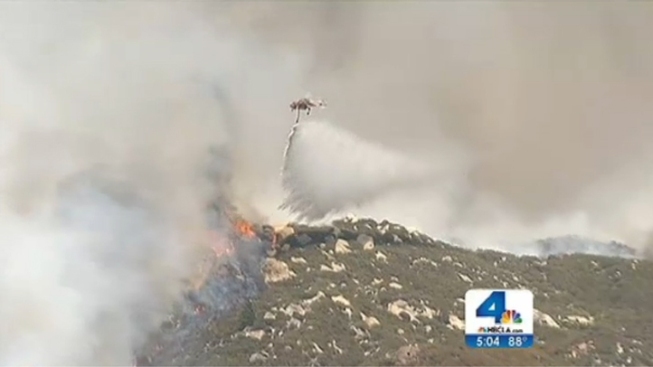 “With the heavy fuels we’ve got and the temperatures we’re experiencing, it’s making it a very aggressive, hot fire right now," Cal Fire spokesman Scott Visyak told NBC4 on Tuesday. "There’s a disaster area in there. It's devastating. There’s several homes lost, there’s several homes standing. The fire had just gone through there very aggressively," Visyak said. Mandatory evacuation orders remained in effect Wednesday for the Andreas Canyon Club (south of Palm Canyon Drive in Palm Springs), Bonita Vista, Pine Springs, and the Zen Mountain Center off of Apple Canyon Road. Camp Ronald McDonald, a charity-funded camp for children with cancer, were voluntarily evacuated due to health concerns related to air quality, as was Camp Joe Sherman. "All campers have been safely evacuated and returned to their parents and the camp grounds remain out of any immediate danger," said Camp Ronald McDonald Executive Director Sarah Orth in a statement. The Pacific Crest Trail was closed from State Highway 74 to Saddle Junction, as were the South Ridge Trail, Carumba Trail, Spitler Peak Trail, Fobes Trail, and Cedar Springs, according to an online fire incident report. Hurkey Creek County Camground and all trails out of Hurkey Creek and May Valley were also closed. Those with day-use or overnight permits for the wilderness area were advised to call the San Jacinto Ranger Station at 909-382-2921. Highway 243 had reopened by Wednesday morning. Fire official urged residents to be alert to fire equipment moving on winding local highways, especially during shift changes at 6 a.m. and 6 p.m. They also asked people in the area not to block roadways when trying to view the fire or firefighting work. and small animals can be brought to the San Jacinto Animal Shelter, 581 S. Grand Ave, San Jacinto. NBC4 reporters Toni Guinyard and Tony Shin contributed to this report. Garcetti: Verdict "Will Not Ignite This City"